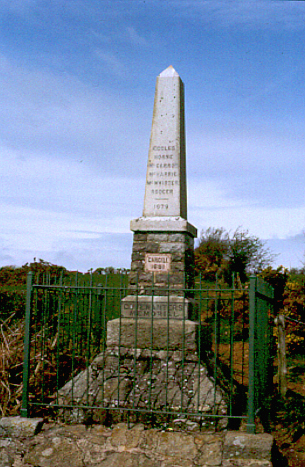 The obelisk standing by the side of the road was erected in memory of the martyrs of Maybole. 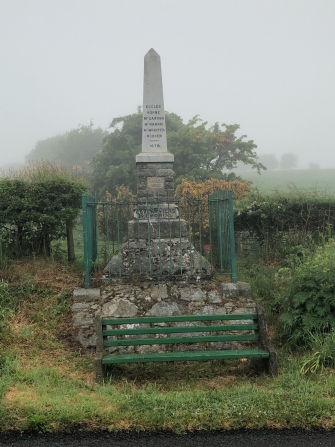 The monument stands on the site of the Cargill Stone, where Rev Donald Cargill held conventicles, including one large one in May 1681. Part of the original Cargill Stone, which was broken by souvenir hunters, can be found on a small memorial in Maybole. The other names on the stone are men from Maybole area who were drowned at Deerness in Orkney in 1679.